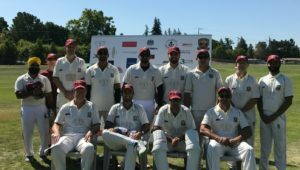 The Napa Valley Cricket Club (NVCC) will host its seventh annual “World Series of Cricket” match this coming Sunday 8th from 10am at the Napa Valley Expo in downtown Napa. The match marks the halfway point in the clubs 2018 season and will be played on the Midway Green, on the western side of the Expo. As ever the game will be hotly contested as the Rest of the World (RoW) team of members look to retain the trophy they won in 2017 against a strong American & Australian (AA) team with the annual contest tied at 3-3. 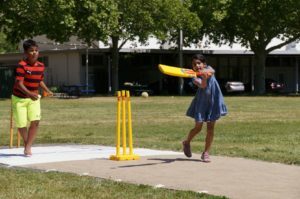 With cricket being the second most popular sport in the world, after soccer, the NVCC uses their annual World Series match to showcase the game and encourages locals and visitors alike to come watch, and learn about, the game. Cricket is played in over 100 countries worldwide and close to home the game has a strong and passionate following in the South Bay. 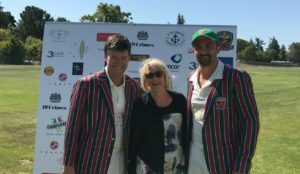 “It’s our big day out each season” said NVCC president Rob Bolch, an Australian, of the World Series match “and with almost all of our playing members available for the match it means the cricket will be of a very good quality from both teams who again this year are looking pretty balanced. We’re always welcoming new members to the club with this year being no exception and the addition of members from New Zealand, Australia, and India means both sides will have strength in depth. The toss for the game, to decide who bats or bowls first, will take place at 10.15am with Napa Valley Expo Board Chair, and Yountville Mayor, John Dunbar performing the task. Commentary on the game will be provided by Australian born NVCC member Scott Curwood. During the innings lunch break and during drinks breaks, explanations of the game and its rules will take place at the “pitch” area in the middle of the ground. Admission is free for the day with food from club sponsor Compadres Rio Grille and refreshments from Clos du Val and Anchor Brewing on sale. An instant cellar drawing with wine worth in excess of $2000 will take place both at the lunch break and at the end of proceedings to raise money for the club. Tickets will be on sale on the day for $5 each or $20 for five.